Cost savings on import and logistic statistics show that in 2015, import of garments in the US was valued at $97 billion. Development of 3D printing and local garment types of manufacturing will enable dramatic cost savings on import, and will lead to a rethinking of logistical costs, since the seller will be able to print the garment from the cloud at a printer center located near the customer, thus avoiding many logistical steps. According to the research done by the University of Regensburg, the top two reasons for returns of garments purchased online are either “size wasn’t right” (52%) or “the garment was damaged” (27%). Transition to customizable sizes in print clothes on demand will enable significant reductions in returns due to problems with size or defects in quality. Today, manufacturing processes’ production of new garment collections lasts 4 to 6 months, taking into account the need to source the fabrics, manual production and globalized logistics. Removal of these steps will enable designers and brands to put out new collections 3-6 times faster. The aforementioned steps will enable the fashion business to increase its profitability on a whole, and the same is true for e-commerce, as it will no longer have the storage and delivery costs. They will also reduce the risks of investments and bulk buying, which will no longer be necessary. As you would expect with any new technology, 3D printing of clothing gravitates towards contemporary design and most intricate shapes, which do an excellent job demonstrating all the potential and promises of such design, accessible for production at home. Israeli designer Danit Peleg, who had first used 3D printing for her graduate collection for a Fashion Design degree, is one of fashion printing’s most prominent advocates. The hallmark of Danit’s products is the reliance on primitive home-use 3D printers that use the FDM (fused filament fabrication) method and the style of her collections, which bring 3D printed clothes closer to the pret-a-porte format. 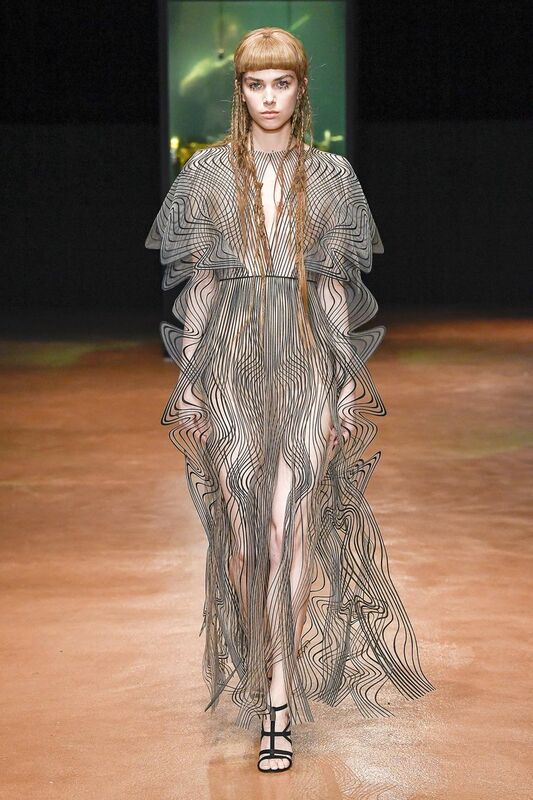 Media attention was also drawn to the projects of Dutch designer Iris van Herpen, who’s futuristic runway shows were noted by fashion magazines globally. In her work, Iris used more complex, industrial methods of 3D printing services. Mass market brands are also paying attention to 3D printing companies, using the new technologies to achieve new heights in functionality, design and weight. One of such innovators is the American brand Under Armour, which created a new design, sole and insoles for their now-legendary 3D printed trainers. Today, many progressive designers and brands are manufacturing clothes, shoes and accessories using different methods of 3D printing. Despite conventional wisdom and forecasts on the increasing pace of technology development, all of the experts agree: 3D printed clothes and shoes are the next step towards customization and sustainability that will change the model of production. In Part 5 of ‘3D Printed Business and the Future of Fashion Business’ Sharecloth founder Sergey Moliavko will be exploring PRINTERS AND MATERIALS.